Our basic white cupcake recipe is so easy to make and will never dissappoint you! Sometimes you just want to kick back and simplify. You know what I'm talking about...just sitting back with your feet on the coffee table, not a care in the world...maybe a good book by your side and a steaming cup of coffee next to it. And just to sweeten the pot....add a little white cupcake to the picture and you've got quite the fantasy going on! Our recipe is just the one to turn this fantasy into reality...and it's so easy. As always, let us know how this white cupcake recipe worked out for you or if you'd like one of your favorite recipes featured on our site, please drop us a line! 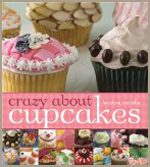 Go cupcake crazy! With nearly 300 awesome, mouthwatering ideas to choose from, you'll find the right recipe for any occasion and every palate. All the basics are lovingly explained so anyone can whip up a beautiful batch. There are varieties for every day (from healthy cupcakes to ice cream indulgences); parties big and small; holidays ranging from Christmas to the Fourth of July; just for kids; and fund-raisers and bake sales. Plus, to make things easy, an entire chart and template-filled chapter focuses on flavor combinations and design elements. You've just have to add this book to your cookbook collection. Get yours by clicking here. 5. Sift together the dry ingredients and add to the butter mixture one third at a time, alternating with the milk. 6. 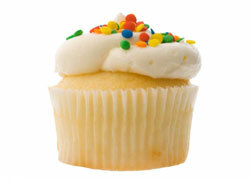 Pour into the prepared cupcake pan and bake for 18 to 24 minutes, or until an inserted toothpick comes out clean.